More climate models FAIL – A chink in the armor at Science? | Watts Up With That? More climate models FAIL – A chink in the armor at Science? Anthony, this short “Perspectives” report in Science seems to me to be worthy of a posting in WUWT. Not only is it a very clear indication of crucial problems with the GCMs, it appears in Science magazine, for years a dogged defender of the faith. I’m including the article (paywalled of course) because I think your readers will be blown away by the figure if you can run it. The authors ran some extremely simplified CMIP5 GCMs, looking only at how they treated water (precipitation, cloud formation), and found extreme differences from one model to the next, as is evident from the figure. In the final section titled Back to Basics, they make clear that the problem is a fundamental one of not understanding the coupling between water and general circulation. They specifically state it would be better to go towards numerical weather prediction rather than continue to expand the coverage of the GCMs. Bjorn Stevens1, Sandrine Bony2+ Author Affiliations 1Max Planck Institute for Meteorology, Bundesstraße 53, 20146 Hamburg Germany. 2Laboratoire de Météorologie Dynamique–Institut Pierre Simon Laplace, CNRS, Université Pierre et Marie Curie, Paris, France. The figure from the article shows how four different models have wide variances on clouds and precipitation. on the climate model, even in the simplest model confi guration. 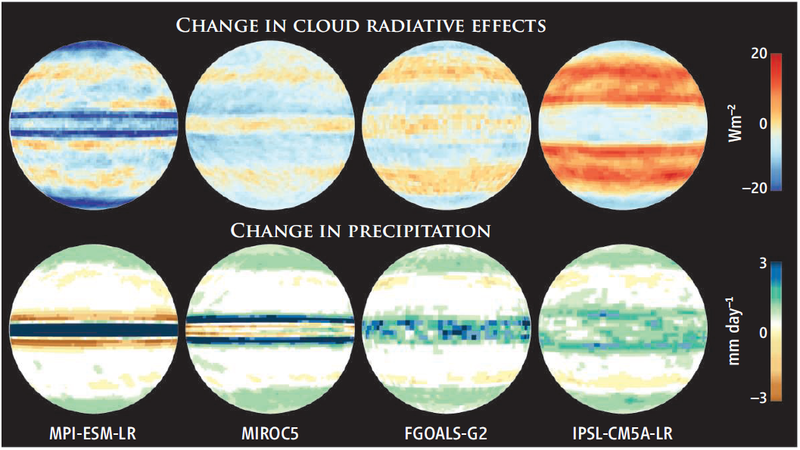 Shown are changes in the radiative effects of clouds and in precipitation accompanying a uniform warming (4°C) predicted by four models from Phase 5 of the Coupled Model Intercomparison Project (CMIP5) for a water planet with prescribed surface temperatures. Clouds and water are central to our global atmospheric processes, and clearly, these models aren’t doing much better than dartboards at figuring out what the real atmospheric score is. Could reality finally be penetrating the previous impervious Modelosphere? It’s getting harder and harder for them to defend all this. Climate models are junk Period, only way to tell future weather is use past Analogs like Joe Bastardi does. History always repeats and weather or climate models are junk more then a week or two out..
Just looking at the precip results from the two left-most models near the equator…shouldn’t that raise red flags? Extreme decreases in precip that close to extreme increases in precip? And one encloses the other in each one (but opposite ways). Is there a rational explanation as to how that’s physically a possibility? Wonderful. Next SkS will be saying they now know that CO2 is not responsible for climate change, or Global Warming. NOT! I have been reading the works of Dr. H. H. Lamb, founder of the CRU, such as “Climatic History and the Future”, and the patterns of climate change of the past million years he and other climate historians present are excellent in explaining current climate. From their works it is easy to determine climate cycles and their magnitudes and trends. The current climate models seem to have been built by totally avoiding establishing a base in past climate change. This is evident in their use of words like “unprecedented” when describing warming that has occurred frequently and in greater magnitude than currently. Much of the current unprecedented warming was “precedented” in the 1930s, 1880’s, in the Medieval Warm Period (850-1350 AD), the Roman and Minoan earlier, and in the granddaddy of them all, the Holocene Climatic Optimum (9000 to 5000 years ago). Not to mention the even-warmer Eemian of 125,000 years ago. Apparently in terms of climate, the only things new under the Sun are a result of ignorance of what has gone before. Won’t it be a hoot if it turns out 0.0001 did absolutely nothing…………. We knew this about GCMs years ago and many have posted on the matter here at WUWT. The question is why are these insiders publishing this now. Especially from the Planck Institute? Are they youngsters “putting their foot down” to protect their scientific careers? Of course someone will be along shortly to explain that these GCMs handle water and clouds just fine. In your report there is much that is new, and much that is true; but what is new is not true and what is true is not new. Dont know where that quotation is from … but it fits. If your hypothesis remains unproven, throw it out. Seems to me that we have passed that point. The models are junk. Quit funding them. I have been saying for a while that there is no crack. There is a tactical retreat into K-12 education globally, coupled with a digital learning and gaming emphasis, so that the next generation will believe this fervently. Because they will have been immersed visually in these MMORPGs that are being designed to create not just a rush but collaboration around battling these so-called threats. I have been working on the Gamification of this and what groups like Institute for the Future are saying when they create these games. These students will believe fervently with every fibre of their being that the virtual world they will be spending time at in school on top of the environmental projects in the community shows what needs to be changed in the real world. I keep trying to disprove this as a focus and the declarations of intent just keep mounting. From the companies and leaders in charge and financing education innovation and assessment. What a phenomenally bad idea. I am struck by the symmetry shown in the models between the hemispheres. I would of thought that would of been a fail mark straight away. Y’know, this probably is old news to cli-fi insiders and journalists who’ve followed the scene closely. But they preferred to keep it in the closet. What else might lurk there? It will be interesting to see if NATURE proves similarly pliant. I doubt it.They’ve got more invested in CAGW. models: Fun to look at, terrible at science!! ‘Pshaw to all this temperature stuff anyway’, I was informed over the weekend. Mankind puts ‘all these gases’ into the air and those gases ’cause climate change’. Some are now able to leapfrog right over the ‘global warming’ aspect of the theory. I suspect this is being encouraged due to the recent lack of increased temperatures. Never mind that! Look at that approaching storm! But the Emperor has no clothes, none at all, never mind the hole in his armor. In hindsight I suppose it’s not surprising. The real Earth is already 70% of the way to a water world. I also was thinking perhaps the authors are younger and either brave or foolhardy to put their names to this, but I have now checked them out on Google Scholar and both are very productive and have been around since at least the mid-90s. So that in my mind makes this an event! How did they get past the reviewers? There is a new editor-in-chief at Science–Bruce Alberts wrote his farewell editorial in this very issue (May 31) after 5 years there. The new editor is Marcia McNutt, a geophysicist. She seems to be mostly involved with subduction, isostasy, and other aspects of the lithosphere. She even has a few publications that seem to be focused on statistics. Could it be that she will require better science for Science? On a water world, the hemispheres are symmetrical, except for the minor change in distance from the sun for the hemispheres’ respective summers and winters. This reality stuff is becoming a real threat. We need to find some way of getting rid of it. Fail mark for “would of”. Surely you have read “would have” often enough to internalise it. A big disagreement between warmists and skeptics is in how observations should be compared to models. The disagreement is large enough that Schmidt, Hansen, Tamino/Stoat are able to say that post 1988 history is largely validated, though at the ‘lower’ end, while Spencer (ref above graph) says the comparison shows an ‘epic fail’. Schmidt et al routinely use 1988 as the reference point and GISTemp as the reference data. Spencer uses neither, and he isn’t alone in this. In the Spencer comparison, the key data comes from weather balloons and satellite data, not station-based temperature data. He fixes the comparison at 1979, not the commonly discussed 1988 These two points of departure from the warmist position demonstrates the depth of the problem with coming to resolution of the debate/argument/dispute/war. In a billboard display earlier this year, CFACT did a similar thing by using HadCru data and not GISTemp data. (In a response to me they said that they couldn’t accept the changes GISS had done to the base data. Rightful in this or not, by doing this, CFACT (Morano) admits that their audience would not be sufficiently swayed if the official American sources of NOAA/NASA were cited; by using only weather balloons and satellite data, Spencer similarly makes an implicit acknowledgement that the temperature data collected and/or analyzed by all the governmental agencies is not sufficiently distinct from official, modeled projections to convince the unconvinced the warmist narrative is off-base. So, as scientists, what would we say is the basis for initiating observation and models at 1979 and changing data-types? We are clearly entering into an argument of apples and oranges if we can’t agree on what should be the reference time and data types. Personally, I’d favour taking the warmist position more than not, as the warmist position is obviously the power-position at present (holding the reins, perhaps, rather than completely in charge of the horse) and the one to counter. As a skeptic, I also think the disconnect of model to reality is sufficiently great (and becoming greater) that we can afford to be generous in the debate: they have given themselves enough roped to be hanged in the next two years. For time: perhaps 1983 would be more “fair” than either 1979 or 1988. If, by 1988, Hansen et al is saying that the principles are settled, and only details uncertain, the pattern BY 1988 should be clear: up-and-down wiggle room through 1988 has a balance point of about 1983. The statisticians in the audience should be able, by referring to r-values in the IPCC models, to say what the reference point should be, however. As for data, we may use the weather balloons and satellites to question the adjustments to raw data GISTemp uses, but we should not discard it: this is the crucial data that Congress and the American public are shown, after all. Ignoring it only suggests we can’t show a true “fail” of the IPCC/Hansen-Gore claims. Agreeing on reference points in time and dataset is crucial to acceptance by the mainstream undecided that the skeptics have a legitimate complaint about the “consensus” on climate change. As long as the warmists can dismiss the skeptics position as manipulative cherry-picking of endpoints, no argument against CAGW can prevail. Hansen is never wrong if what he claims is different from what we argue about; we are never right if Hansen isn’t concerned about what we are talking about. A 1983 or so beginning-of-comparison still shows the modelling to have an epic fail. When you are dealing with a chaotic system, whether it be a human being or a weather pattern, it is unlikely you can ever come up with a single “answer.” Chaos theory suggests you may, in certain circumstances, have answers “attracted” to a certain range, (IE Strange Attractors,) however even that theory is still in its infancy, and has a long way to go before it produces much that can help with a specific forecast. I’ll still take Bastardi over a computer any day. “There is a temptation to make a science out of psychology, because certain patterns of human behavior seem recognizable. Though Chaucer created the Wife Of Bath back in 1375, she reminds me of a lady who served me burgers back in college, and though Shakespeare created Falstaff in 1593, Flastaff reminds me of a guy I worked third shift with, in a cannery. Certain characters are like certain weather maps, and provide us with analogs we use, and give us the sense we can predict behavior in the same manner we can predict the weather. It doesn’t matter whether you are attempting to predict humans or weather, not even the hugest computer in the world can give you a single answer that is right. “…what is new is not true and what is true is not new….” . I have no idea where this might orginally come from , but it is somewhat simliar to and old russian Soviet-Era folk joke, the two main public newspapers there at the were named Pravda (= The truth ) and Isveztija ( The News ) , and some section of the public then usde to claim that there existied an old proverb that went like this: ” There is no Isveztija in the Pravda, and no Pravda in the Isvestija” , which if translated literally becomes ” There are no new(s) in the truth , and there is no truth in new(s)” , maybe soone hijacked that thougth ( sarcasm) from there. Has got it right down to the licks. I’ve had it with your keyboard clicks. Thanks for the research. Good news on the authors. Maybe Science Mag is making something of a move toward reality. When Science starts covering the success of sceptic models over mainstream models then there is actually a chink in the armor. Until then, jumping on every admission of imperfection as though it is THE END of climate science just makes you sound like creationists have since the ’60’s. They’ve been constantly proclaiming the imminent collapse of mainstream biology…for decades. What the authors point out quite honestly is that there has been no improvement in how GCMs treat water since 1963 when Joseph Smagorinsky first attempted to do it. And that despite the fact that what Smagorinsky had was an IBM mainframe that does not compare even to a laptop today while the modeling kings of IPCC have dozens of supercomputers at their disposal. If I had any authority on this I would decide that if fifty years of attempting to model that system with the best equipment available does not give believable results it is time to stop wasting money on it. We knew that models were constantly producing wrong projections and yet no one has been held accountable for that. The mid-troposphere results that Roy Spencer shows are a case in point. These CMIP5 morons chose mid-troposphere to model because it does not have anything in common with climate down on this earth. It cannot be compared to any global temperature trends or climate features like the El Nino phenomenon. I occasionally check mid-troposphere temperature trends and have found a long-term down trend that corresponds to nothing on ground level. And those data from 73 models, working on 73 supercomputers, are meant for the upcoming AR5 report. I rate their real information content as zero, especially since their base temperature projection does not use the newly revised versions of ground-based temperature curves in which the phony late twentieth century warming has been removed. Hummmm,,,, the Sun which provides 99+% of our energy has something to do with climate? When Science starts covering the success of sceptic models over mainstream models then there is actually a chink in the armor. Until then, jumping on every admission of imperfection as though it is THE END of climate science just makes you sound like creationists have since the ’60′s. They’ve been constantly proclaiming the imminent collapse of mainstream biology…for decades. And, so, what is your ACTUAL opinion? The sad epitaph about Richard Alley, Mann, Hansen, Schmidt (Gavin) and Trenberth is that they do no possess the ability of comprehension. For them ‘Climate Science’ is the greatest religious drug ever invented ! In addition, they have profited by there buffoonery for years ! Now they desperately hope to profit by it for their retirement programs. Dr. Spencer has clearly shown that all 73 models have failed compared to empirical observation. There are many differences in the various parameters between the models. A logical explanation would be that a common assumption for all the models is in error. All the models assume that the net effect of adding radiative gases to the atmosphere is warming. Could there be an error in the “basic physics” of the “settled science”? What would happen if you solved for just radiative flux for increasing concentrations of CO2? Radiative gases are critical for tropospheric convective circulation. What would happen if you failed to model the increased speed of tropospheric convective circulation and the resulting increase in surface cooling that would result? You might get the wrong answer. You might conclude that the net effect of radiative gases in our atmosphere is warming. A mistake THAT bad would require an escape plan for the climate scientists involved. Plan A. Come up with a “sciencey” sounding excuse that hides the real reason all the models failed. The heat is hiding deep in the oceans! It will be back! The warming is being masked by aerosols! Natural variability greater than previously estimated! Climate sensitivity may be less than previously estimated! Did we say 6C? No, no we meant 2C! – but the Internet scrutiny will never end. Plan B. Airline tickets to Brazil. “Mainstream models” progressively diverging from empiric data = failure to understand climate processes. Is that so hard to comprehend? Hey Puppet Person…Cool it. Your rhetoric crossed the line further up-thread. This is pretty good science. For one thing, it is VERY SIMPLE. No problem complexity to fall back on. Given that, the divergence of the model results shows one very straightforward thing. The underlying dynamics of GCMs is both highly nonlinear and chaotic. A second very interesting question would be just how sensitive even the models THEMSELVES are to perturbations in initial conditions. Presumably the figures above are some sort of average over many runs from many random initial conditions (at least, that’s how I would do it). It would be interesting to see the spread in dynamical state or its real-time time evolution and not just the average over it. I would predict that there is almost as much variation within most of the models as there is between them. One can then add complexity just a little at a time to see how it affects the spread even more. Perhaps latitudinal “continental” bands. Perhaps orange-wedge shaped continents. Perhaps continents shaped like the black patches on a soccer ball. Perhaps similar variation in ocean depth — water worlds aren’t going to build up anything like the north-south oceanic currents (e.g. the Gulf Stream) that dominate European weather. If global warming ever does get out of hand, all one has to do is shift the GS a few degrees south and Europe goes straight into the icebox and the next ice age begins. Oh, wait, you mean we cannot change enormous global circulation features like ENSO and the GS that dominate the patterns of the climate? Darn! In “Crouching Tiger, Hidden Dragon” (Ang Lee, 2000) a notorious bandit chief called Black Cloud tells his latest conquest, “All this Black Cloud stuff just makes my job easier.” Indeed… the Green Gang of Briffa, Hansen, Jones, Mann, Trenberth et al. promote this bumpf as they descend on taxpayer caravans, freezing at the very mention of (gasp) “Anthropogenic Global Warming” [say what?]. After a quarter century of this BS since 1988, it’s high time that private-citizen Route Masters kibosh “Dark Cloud” forever. Doug Proctor: I think Dr. Spenser uses 1979 as a start date is because that is when the satellite data begins. Please correct me if I am wrong. Correct. Death wishes should not be posted; the moderators should remove this one. Wait, so weather is climate, now? Ryan (7:39pm), speaking of chinks in the armor, I’m actually quite pleased that you are still around. Have you had a few sips of our “Koolaid’ by now? You are not a stupid person, and so you must have noticed that the levels of intelligence and thoughtfulness here are refreshingly far above those at the tiresomely memetic “warmist” sites, occasional kooks here notwithstanding. Perhaps you are an honest enough inquirer to be willing to test your preconceptions against some formidable and deeply knowledgeable intellects. In that case, look up some of the lengthier posts of “rgbatduke” (Dr. Robert G. Brown, sample a few comments above this one), Richard Courtney, Greg Goodman, Willis Eschenbach, and “ferd berple”, to name but a few. Then buzz over to Climate Audit for more of the same with an emphasis on statistics. You may find you like hanging out with highly intelligent and articulate and honest people, as I do. And you may find your views changing. If you are not open to having your views changed through an increase in knowledge and understanding, I advise you to cut your losses and get out of here, because many here will tell you that is just what happened to them. They hung around too long and lost their warmist “faith”. Can you choose wisely, grasshopper? Pamela (9:11pm, re Master_Of_Puppets at 6:05 pm) my sentiments exactly. Mods, would you kindly have a look? Passable. Better: Fail mark for “would of”. Surely you have read “would have” often enough to have internalised it. Doug Procter..there is no comparisim(sp?) between models and observation. I can make a model that says you are a complete twit,but real observation says you are a nice guy. I can make a model say anything,observation shows the truth.Sort of like the model says my backyard is in a drought,while observation shows it is actually 2 feet under water. Why? If you say 1 + 1 = 3, you’re wrong, whether I can add 1 + 1 correctly or not. I can’t speak for all skeptics, but personally I don’t think anybody can predict the Earth’s climate system. if somebody says he can, I smell a rat, not a scientist. Eh? Who wants the “end of climate science”? The “imperfections” just show that the CAGW scare is a politically-motivated hoax. Did it ever occur to you that the end of climate politics could be the beginning of climate science? All models start with a premise and attempt to codify using data. The difference with climate “science” from all other science is that it is the data that is adjusted not the model. Every time I see where the tireless and unsung efforts of some poor fellow in the 1930s trudging out read a calibrated thermometer daily or more often only to have someone 80 years later decide that his 1/10th degree reading was off by 2 or 3 degrees is just astounding. How many more times does this grizzled old engineer who has measured coupled convection and radiation in metallurgical plants around the World have to state the bleedin’ obvious. The Trenberth energy balance exaggerates lower atmosphere IR energy absorption by up to 6.85 times and there is net zero absorption of ~15 micron CO2 energy. This is then offset in hind casting by using double real low level cloud optical depth. It’s a scam by the ignorant, now supported by the fraudulent and the stupid. As for the ‘OLR bite’ heating, that is exactly offset by a lower atmosphere process that easy to work out if you have the right physics’ knowledge. The atmosphere oscillates about the set point OLR = SW IN and there can be no CO2-AGW because that’s the working fluid of the heat engine. As for ‘back radiation’, a part of climate alchemy that is supposed to explain its anti-science, it does not exist as any competent professional taught Maxwell’s Equations knows from 2nd year degree level. Yet it’s taught as fact in Meteorology and Climate Sciences. What must be done is for all these curriculae to externally approved so these people can’t continue teaching this new Lysenkoism. Yes, it’s as serious as that because this anti-science is permeating into the rest of science. No, keep funding them. Every day that passes they make the AGW claims look more and more stupid. To Master of Puppets I agree with the others about your previous comments. Please don’t let us sink to the level of the Warmists. Logical arguments not death threats will win in the end. On a lighter note friend of mine put this quote on Facebook this morning, very prophetic! Sweet! Keep up the good work. I read MOP’s comment as a metaphor for certain careers, not biological processes. Just as we don’t want to veer too far into the marsh of rhetoric that the alarm crowd as become mired in, I do think that we ought to avoid any extreme tendency to read comments too literally. It is as we can see from the article itself all to easy to accept what our models tell us. The very, very important point in the article is unstated. Science, the process, is working as it should. It was first used by the historial Macaulay speaking of the British Navy in the reign of Charles II. He said that it was staffed by, as I recall, officers and seamen. Unfortunately the seamen were not officers and the officers… were not seamen. As told many years ago it depended on the pun on ‘seamen’ meaning in the one phrase the crew and in the other phrase professionally qualified men of the sea. Its been used a lot since. As in during the years leading up to the financial crisis the banks were staffed by prudent men and managers. Unfortunately the prudent were not managers and the managers not prudent…. And so on. What are the models missing? But still the figure of Roy is misleading here. The magnitude of the warming observed and the regions of the planet that warmed in the last 70 years does not match the predictions of the GCMs. The GCM predicted that the majority of the warming should be in the tropics where there is the most amount of long wave radiation emitted to space and where there is ample water to amplify the CO2 forcing warming. The majority of the observed warming was in high latitude regions not in the tropics. The regions of the planet that have warmed in the past 70 years are the same regions that warmed in the past cyclically. The past cyclic warming correlates with solar magnetic cycle changes. The past cyclic warming cycles have all been followed by cooling phases (sometimes abrupt cooling phases). There is currently a very unusual slowdown of the solar magnetic cycle underway. The current observations support the assertion that we are going to experience the cooling phase of a Dansgaard-Oeschger cycle and the initial cooling will be relatively abrupt as compared to the warming experienced. There is now the first observational evidence of cooling in the regions that warmed. The unusual solar magnetic cycle continues. I am trying to imagine what will be the public’s and media’s response to cooling (same regions that warmed in the recent past will now cool), how the cooling will affect scientific analysis, and how the cooling will affect negotiations concerning climate ‘change’. look up some of the lengthier posts of “rgbatduke” (Dr. Robert G. Brown, sample a few comments above this one), Richard Courtney, Greg Goodman, Willis Eschenbach, and “ferd berple”, to name but a few. I’d include Bill Illis in the first rank. The models fail because their assumptions are wrong. First remove the CO2 driver. Second assume all feedbacks negative. Thirdly, model in solar variations and full insolation not that assumed by K&T as a quarter of the true figure. There are chinks all over the place. Those “missing factors” happen to be the planet’s most potent H2O heat-transport mechanisms. Which dominate all. People put faith is these climate models as if they were created by Mr. Spock on an episode of Star Trek. What people don’t understand is the modelers don’t really know how the climate system works and these models include a great deal of unverified beliefs about how the climate system works. It should be simple to understand this observation about climate models — if you build a model based upon the belief that more CO2 causes warming, then your model will show more CO2 causes more warming. By coincidence Notrickszone has a presentation from Prof. Murry Salby in Hanburg on climate model failures. Why do the simulated pictures all look like Jupiter? My actual opinion is of very little value, as I am not a climate modeler. Which climate models do you think hit closest to home? Is it Anthony’s model? Any of the various climate creationist’s models? Oh wait, none of those actually DO unique modeling. Half of the posters here doubt the greenhouse effect, a quarter or more seem to think the rise in CO2 is natural. Even the well-spoken ones can’t see clearly enough to see that their snipe positions are mutually exclusive with each other. No, I am not impressed with the dialogue here. It is childishly awful. I once read a thread on Pokemon forums about how these guys just knew that Pokemon were real but just outside of our perception. They ha graphs, complex light equations, data. Someone without any education could probably have believed it if they hasn’t used the work Pokemon. The situation here is similar. “Mainstream models” = Argument by consensus. Logic FAIL. “climate science” = Warmist (aka “consensus”) science = Appeal to Authority. Logic FAIL. “makes you sound like creationists ” = False analogy + Ad hominem. Logic FAIL. What else have you got, Ryan? Hmmmm? Once a hot believer in CAGW Lovelock has since changed his mind. Here he is on climate scientists. The great climate science centres around the world are more than well aware how weak their science is. If you talk to them privately they’re scared stiff of the fact that they don’t really know what the clouds and the aerosols are doing. They could be absolutely running the show. We haven’t got the physics worked out yet…..
……….“The world has not warmed up very much since the millennium. Twelve years is a reasonable time… it (the temperature) has stayed almost constant, whereas it should have been rising — carbon dioxide is rising, no question about that.”………….. This climate war is being fought out in slow motion but gradually reality is smacking these people in the forehead. This year there has certainly been more scepticism in the MSM and carefully phrased doubts by some climate scientists. When Science starts covering the success of sceptic models over mainstream models then there is actually a chink in the armor. Until then, jumping on every admission of imperfection as though it is THE END of climate science just makes you sound like creationists have since the ’60′s…..
Sceptics and scepticism does not require models to falsify the CAGW religion. On the subject of religion have you asked John Cook whether he believes in Creationism? Some day, somebody is also going to tell them that the “non-condensing greenhouse-gas”, carbon dioxide, has significant solubility in the condensing greenhouse-gas, water. I’m fairly certain they know, since this is taught in high schools. Perhaps time for a more serious assessment of my New Climate Model and the recent refinements of it ? It would be great to discuss the “models” (and their usefulness) with warmists, but once I start talking about differential equations, coupling, non-linearity, boundary and initial conditions, numerical methods, and stability, they suddenly clam up. A logical explanation would be that a common assumption for all the models is in error. All the models assume positive water feedback. Yet during the period of warmng, atmospheric moisture has been observed to be declining, the exact opposite of what was assumed. The failure of the models to explore negative water feedback shows clearly that they are not attempting to model climate. Otherwise, why not try adding negative water feedback to the models and see if this helps the models match current temperature? The simple fact is that without positive water feedback, it is generally agree that climate sensitivity will not exceed 1C. In other words, without positive feedback, the effects of CO2 are likely to be beneficial, not harmful. Thus, the models do not explore negative water feedback, because their continued funding depends upon funding CO2 harmful. It is the funding that is behind the corruption of climate science. And make no mistake, it is corruption that we are talking about. Forget about Climate Disruption, the problem is Climate Corruption. The corruption of the scientific method to attract increased government funding for climate science. Started at the end of the NASA moon landing program, when the mission of NASA was changed from studying space to studying “inner space” – the earth, in response from budget pressure to meet “cost benefit” policy requirements. Once NASA has reached the moon, they had fulfilled the Kennedy legacy. There was no benefit to be gained in further exploration. Those of us alive at the time will recall the political pressure that was applied to NASA to stop the program, even though there were Saturn V’s already built, ready to launch. Spend the money instead to help people back home became the cry. So, NASA re-tasked itself to “mission earth”, and “Climate Science” was born, using the funds earmarked for lunar exploration. Over the years, to continue the funding, the pressure increased to show the benefits of Climate Science. For there to be a benefit, there had to be a risk, a threat to be defeated. Thus AGW was born. The war on CO2 had begun. ‘Oh warm new world that hath such modellers in it.’ – Tis new to them. To geologists it’s ancient history, written in the stony record. Here is what the US gave up in return for Climate Science. The Saturn V (pronounced “Saturn Five”) was an American human-rated expendable rocket used by NASA’s Apollo and Skylab programs from 1967 until 1973. A multistage liquid-fueled launch vehicle, NASA launched 13 Saturn Vs from the Kennedy Space Center, Florida with no loss of crew or payload. It remains the tallest, heaviest, and most powerful rocket ever brought to operational status and still holds the record for the heaviest launch vehicle payload. To date, the Saturn V is the only launch vehicle to transport human beings beyond low Earth orbit. A total of 24 astronauts were launched to the Moon, three of them more than once, in the four years spanning December 1968 through December 1972. You picture it as “imperfection” yet is that a fair picture? ie. that’s it’s 95% correct and only a few minor problems? The criticisms are that the models go in largely the wrong direction. That cause and effect were mixed up. And that the cause and effect are so closely related that it is very hard for very smart people to figure it out. Read for yourself whether people are trying to be open minded, and then see whether the creationists you dislike are open minded. Ask yourself whether you are open minded. Half of the posters here doubt the greenhouse effect, a quarter or more seem to think the rise in CO2 is natural. This statement shows a mind incapable of thinking clearly. Clearly Ryan immediately notices the people who meet his description while discounting others. This is well known confirmation bias. Clear evidence of poor critical thinking skills. Personally, the existence of the GHE is clear. Simple physics. However, poor thinkers like Ryan discount the overall effect of GHGs. Once again he immediate discounts that which he doesn’t want to believe. GHGs are the coolant of the atmosphere. About 40% of the radiation that is not reflected eventually ends up bouncing around in the atmosphere on its way to space. The cooling effect of GHGs must be figured into the overall effect of GHGs in order to know the complete picture. As yet I have never seen a peer reviewed paper try to make this computation (it is not easy). The bottom line is we don’t know the complete effect of GHGs let alone CO2. Ryan appears to think that is just fine. As for CO2 the computation of volcanic CO2 is based on Gerlach’s 1991 paper which looked at 10 volcanic sources. Since that time it has been discovered there are nearly 3 million volcanic sources. To understand the total contribution from volcanoes (statistical sample) we’d need to examine over 1700 sources. A reasonable scientific mind would not accept current estimates until that work was done. However, Ryan accepts the statistical uncertainty simply because it fits his beliefs. Ryan’s support of CAGW is completely faith based like most alarmists. Not only that: the premise regarding how CO2 affects temperature has now been disproven and by NASA no less – I wonder what this paper had to do with Hansen’s recent resignation? Ryan, my observation is that the AGW climatologists don’t seem to use heat and material balances or thermodynamics to draw conclusions. It is hard to tell what is included in courses required to get a doctorate in th climatology option from the course names but they don’t appear to reflect many basic chemical engineering techniques. I suspect they do know that when water vapor condenses and falls back to the earth that it absorbs carbon dioxide. I am less certain that they know that rising carbon dioxide levels in the atmosphere causes water vapor to be displaced into outer space, thus creating a sort of indirect temperature relief valve. The probable reason for this inconsistency re clouds and precipitation ( neither new news) is inherent in the grid scale of all GCMs, itself inherent in supercomputer computational limitations. So convective processes like tropical thunderstorms cannot be modeled, only parameterized. That is why WE can derive equivalence to a linear difference equation. Which says emergence properties like Lindzen’s adaptive iris cannot emerge. So water vapor feedback is overstated (precipitation understated) and cloud feedback wrong. So Sensitivity too high. It is all consistent, and amazing that climate scientists pretend it is not clear. Except now, apparently weather is climate due to, I suppose, the failure of models to match observed conditions. I would like to see this rather huge flip-flop highlighted more in the general climate conversation over cAWG. It drives me mad that the warmists are not called on this massive 180 degree change. According to http://www.thegwpf.org/how-much-money-are-us-taxpayers-wasting-on-climate-change-try-106-million-a-day/ the US was spending approximately $4 billion on climate science research. Adjusted for inflation, the Apollo program cost $135 billion. That’s $10 billion a year. The Space Shuttle was costing about $450 million per launch and that was mostly reusable. NASA’s budget in 2012 was $17.77 billion (http://www.nasa.gov/pdf/750614main_NASA_FY_2014_Budget_Estimates-508.pdf). On that they couldn’t really have a manned moon landing program and even $4 billion on top would hardly make a return to the moon possible. On the whole I don’t think the US gave up the moon is return for climate science. And I suspect climate science was already being studied before Werner von Braun persuaded JFK to do the other thing not because it was easy but because it was hard. Another false argument revealing your ignorance of science and the scientific method. Skeptics don’t need to create a climate model in order to show the existing GCMs are false. Nobody has to “prove it’s NOT true,” as it were. The way real science works is the models must prove their models are valid. Not only have they not done that, the actual data shows time and time again that models are invalid, that the rreal climate does not work the way the models hypothesize. The GCMs are themselves nothing more than hypotheses. Pity they forgot to include it in the models then, isn’t Ryan? If CMIP5 models are now so advanced that they include a carbon cycle, it really does beg the question “then what were they doing beforehand”. Ryan would you or any of the other warmists like a debate? Please note this is an open invitation to all warmists. I found it interesting when I presented the below noted papers (roughly 7 years ago) in the Realclimate forum that the Realclimate scientists had not read the papers I quoted. I persisted, presenting additional papers and a connected logical argument to support the assertion that the majority of the warming in the last 70 years was caused by solar magnetic cycle changes not increases to atmospheric CO2. At that time I also presented a series of papers that predicted a slowdown in the solar magnetic cycle and planetary cooling. When it became obvious, that the Realclimate heavy weights could not defend the warmists’ theory, I was blocked with the comment, ‘off message’. The 16 years of no warming is a problem that will not go away. The 16 years no warming is, however, only one of many problems with the warmist manipulated ‘science’, see below for details. In addition to the scientific failure of the warmists’ theory there has been a sudden, unexplained abrupt change to the solar magnetic cycle. Based on what has happened before and the mechanisms by which solar magnetic cycle changes modulate planetary clouds the planet will cool due to this solar magnetic cycle change. There is now the first observational evidence of cooling. It is extraordinarily difficult to defend manipulated incorrect scientific arguments that ‘support’ the warmists’ theory when the planet is cooling. 1) The latitudinal pattern of warming in the last 70 years does not match that predicted by the AGW theory and the general circulation models. There is too much observed warming in the Northern Hemisphere ex-tropics. There is hardly any warming in the tropics. The AGW theory predicts that the majority of the AGW should be in the tropics where there is the most amount of long wave radiation emitted off into space and where there is amply water to amplify the CO2 forcing warming. The latitudinal pattern of warming in the last 70 years supports the assertion that a significant portion of the 20th century warming has caused by something else rather than CO2 or other greenhouse gases. The warmists have ignored the fact that the latitudinal pattern of warming does not match their theory. The pattern of warming matches a different mechanism, solar magnetic cycle change modulation of planetary clouds. 2) There are cycles of warming and cooling in the paleo record. The regions that warmed in the past are the same regions that warmed during the last 70 years. The planet was warmer than current during the past cyclic warming periods. To help push the warmists’ agenda, the Mann Hockey stick paper tried to make the Medieval Warming period go away and was caught. There are solar magnetic cycle changes that correlate with the past warming and cooling phases. The sun was at its highest activity in 8000 years and was highest for the longest period of time in 11,000 years during the last 70 years. Persistent Solar Influence on the North Atlantic Climate During the Holocene (William: Holocene is the name for the current interglacial period. The late Gerald Bond was able to track 23 of the cyclic warming and cooling cycles through the current interglacial period and into the glacial period. As he notes in this paper there are cosmogenic isotopes change that correlate with the cyclic warming and cooling which indicates that solar magnetic cycle changes cause the cyclic warming and cooling. Later research determine the sun cause the cyclic warming and cooling by modulating the amount of planetary clouds. 3) There has been 16 years of no significant warming. CO2 continues to rise planetary temperature does not. In addition to the fact the latitudinal pattern of the warming does not agree with the warmists’ theory the magnitude of the warming does no agree with the warmists’ general circulation models. 3) There is no tropical tropospheric warming and there is no significant warming in the tropics. The IPCC general circulation models predict that the most warming on the planet should be at around 8K above the surface of the planet in the tropics. This predicted warming amplifies the CO2 forcing and is due to increased water vapor in the atmosphere in the tropics. 20 years of measurement by satellites and temperature measurements using over a 100,000 weather balloons supports the assertion that there is no tropical tropospheric warming. Supporting the lack of tropospheric warming in the tropics is Lindzen and Choi’s analysis (2009 and 2011 papers) which found that planetary clouds in the tropics increase or decrease to resist forcing changes by reflecting more or less sunlight off into space. That result explains why there is no tropical tropospheric warming and explains why there is almost no long term warming of the tropics. 4) There has been an abrupt unexplained change to the solar magnetic cycle. In the past the planet cooled when the solar magnetic cycle slowed down. This change appears however to be an interruption to the solar magnetic cycle rather than a slowdown. Based on what has happened in the past and a hundred or so published papers that almost solved the problem of the mechanisms, the planet will now cool. 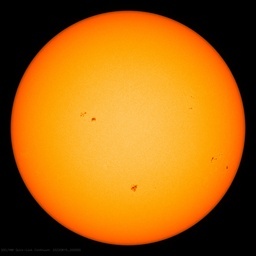 The magnetic field strength of newly formed sunspots is decaying linearly. 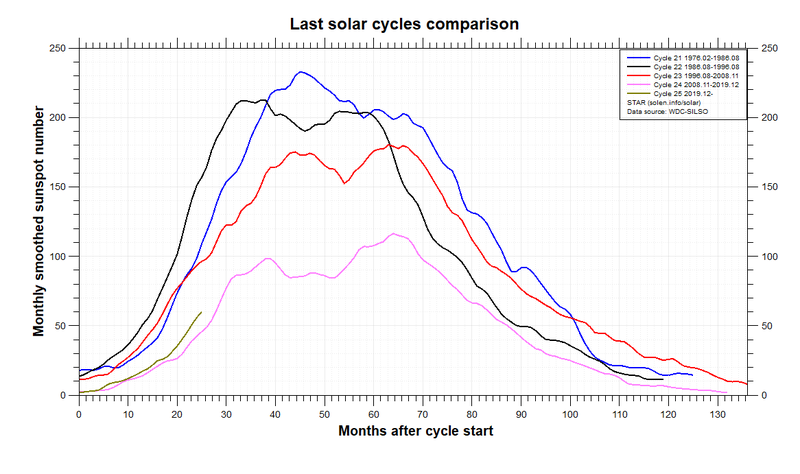 The following graph, a comparison of the past solar cycles 21, 22, and 23 to the new cycle 24 is provided. That graph is update every six months or so. Those counting sunspots have tried to their best to hide the abrupt change to the solar magnetic cycles by counting sunspot groups using magnetic spectrum observations rather than visual using the standard method which enables historic comparison of sunspot numbers. It appears based on observation that the sun will be spotless by the end of this year..
You may be the only person to comment here who has actually gone to a Pokemon blog. Have you also visited Smurf and Cabbage Patch blogs to find correlation with climate science? That’s actually the opposite of what I said. Are the models perfect? No, and nobody say they are. Are they better than non-existent sceptic models? Yea. Does every paper showing a problem in the models suggest we should toss them out? Lol no. It shows that the science is honest. Well, you do have to discriminate in your reading anywhere. Both sides have gullible closed-minded folks who don’t elevate the discourse one iota. It’s easy to see who are the honestly-thinking and concerned ones. I suggest a daring experiment. I say daring because it’s too easy to go along with the herd. Suspend belief and read serious criticisms of the CAGW positions presented by climate scientists who are tenured professors with important, peer reviewed papers. In addition, ask yourself why these scientists don’t just go along and get the easy gravy train grants and the adulation of the many, but rather tend to be marginalized and pilloried by their peers. You are not a scientist, perhaps, but much of the presentations of these people are easily understood by interested readers. I, and many others on the skeptical side know whereof we speak. Before looking into the science, I saw no reason not to accept the IPCC position and I wouldn’t have even looked into it if it didn’t become more and more obvious that it was a promotional agenda-driven political activism (plus being a multibillion buck gravy train for proponents). This turned my attention to details for which I can claim expertise – in the field of geology. Pacific coral islands do not get drowned out, they grow with sea level rise and have grown over 120 metres since the 50 million cubic kilometres of ice of the last Ice Age melted. Ditto with deltas, like the Mississippi and the Ganges, they too, grow upwards and outwards with sea level rise (sea rises, moves upstream, creates still water into which the streams silt, sand and gravel settles out thereby building the base up). It is simply dishonest political activism (mixed with ignorance) that has created all the foofoorah about Pacific Island countries and delta dwellers. This naturally lead me to learn about all the other features of the climate system and hear what experts in these fields had to say – to my surprise, similar objections were being raised by thoughtful specialists (yes, there was no shortage of foaming-at-the-mouth supporters of the criticisms who may also had a political agenda or psychological problems, perhaps – I’ve noted that some unappeasable activists had difficult relations with their fathers, but that’s another story- this is true as I said of both sides of the debate). All in all, I ended up getting a well rounded education in science and a dusting off and upgrade of my math. Also you can walk into what ever depth you want – an understanding of basic, non-mathematical concepts or even over your head if you like. Hey, what is there to lose. No one has to know. You found yourself here by yourself out of curiosity – that’s a start. Tell me what is wrong with this idea. I spend quite a bit of time reading all kinds of pseudoscience blogs. I think it is fascinating the way people come to believe absolutely in the weirdest things. I think most of the posters here on wuwt could learn a lot about themselves by spending some time in ICR forums. Is this something else the climate modelers got wrong? Just speculation as the latest hight tech tools were not available between 1929 to 1940. A final note: What about the effects of human-induced global warming on SLR? Will it really increase the rate above its natural value, as predicted by the IPCC? We do have a handle on this question by observing what happened when the climate warmed suddenly between 1920 and 1940, before cooling between 1940 and 1975. The answer is quite surprising and could not have been derived from theory or from mathematical models. The data show that SLR slowed down slightly when the climate warmed and accelerated when the climate cooled…. No thanks. Creationists remind me too much of climate alarmists. Hoipefully soimeday people will come to the realization that ALL models, even those honestly attempted, are nothing but artiificial constructs driven by assumptions that can never approach reality. , G. R. Asrar, J. W. Hurrell, Eds. (Springer, Berlin, 2013). “Sign of cloud changes … differ fundamentally between models.” Who’dathunkit? Ryan: Which climate models do you think hit closest to home? Another question: Is any climate model demonstrably reliable enough to support planning for the future? So far the answer is “No”. All the models are too inaccurate to credit, and their proponents offer diverse exculpations for their failures. If the climate models don’t agree, then they can’t all be right. However, the key question remains — Has any GCM been shown to accurately predict the future climate? Yes there is lots to read. And the conclusion of the 2013 paper which you quoted is the general circulation models have a ‘warm bias’ in the tropics that is not observed which supports Douglas et al’s conclusions. Douglas et al was however more specific about the general circulation model warm bias. The general circulation models had a warm bias of 100% to 300% below 8km. At 8 km where there the GCM predict the most amount of warming the tropical troposphere has cooled rather than warmed. It should be noted the GCM predict the planet should warm in tropics not in the high latitude regions particularly in the high Northern latitude. James Hansen notes that was one of the ‘surprises’ in his book. That ‘surprise’ also supports the assertion that the majority of the warming in the last 70 years was due to solar magnetic cycle modulation of the planetary clouds rather then the increase in atmospheric CO2. The past cyclic warming and cooling had a cause. Past solar magnetic cycle changes correlate with past warming and cooling cycles. The past warming occurred in the same regions of the planet that warmed in the last 70 years. The scientific details concerning how the solar magnetic cycle modulates planetary cloud cover is quite interesting. The last solar magnetic cycle change inhibited the two of the mechanisms which makes it appear that low level and high level clouds (cirrus) are no longer modulated by levels of galactic cosmic rays (mostly high speed protons, which strike the atmosphere creating ions. The ions increase the amount of low level clouds and decrease the amount of high level cirrus clouds. Low level clouds cool the planet by reflecting sunlight off into space high level wispy cirrus clouds warm the planet by the greenhouse effect). The inhibiting mechanism only occurs when the is abrupt change in the solar magnetic cycle and explains why there is delay in cooling when there is an abrupt change to solar magnetic cycle. As I noted there is now observational evidence that same regions that warmed in the last 70 years are starting to cool. What has happened before cooling when there is a slowdown in the solar magnetic cycle will happen again. I would assume you are familiar with the Little Ice age that followed the Medieval Warm period? See the other cyclic warm and cold periods in the Greenland Ice sheet data. The Little Ice Age (LIA) was a period of cooling that occurred after the Medieval Warm Period (Medieval Climate Optimum). While it was not a true ice age, the term was introduced into the scientific literature by François E. Matthes in 1939. It has been conventionally defined as a period extending from the 16th to the 19th centuries, or alternatively, from about 1350 to about 1850, though climatologists and historians working with local records no longer expect to agree on either the start or end dates of this period, which varied according to local conditions …. William: This is a link to an excerpt from the paper Steve Mosher quoted. The climatology, seasonality, and intraseasonal to interannual variability of the tropical tropopause layer (TTL) temperature field are examined using the state of the art climate models that participated in the Coupled Model Intercomparison Project Phase (CMIP 5 ). Nevertheless, the models have several notable limitations. First, almost all models have a warm bias in the climatological mean temperature in the TTL in the deep tropics (Fig. 1). Second, large inter model differences occur in the amplitude of the seasonal cycle in the TTL temperature (Fig. 3). Third, many models overestimate tropical lower stratospheric warming associated with volcanic aerosols (Fig. 4). Fourth, the amplitudes and phase speeds of equatorial waves are highly variable among the models (Fig. 7). Finally, a realistic QBO and MJO are missing in most of the models. William: This is the paper by Douglas et al, that notes the GCM models incorrectly model the tropics. There is no amplification in the tropics and as Lindzen and Choi found clouds in the tropics increase or decrease to resist a forcing change. Bummer of the warmists. It appears they do not care if the science does not support their position. It appears they have not consider what will be the implications if the planet cools and everyone finds out by observation the warmist hypothesis is false. I think it is fascinating the way people come to believe absolutely in the weirdest things. Exactly. And the weirdest thing of all that people believe in is Manmade Climate Change. The lack of evidence for it only seems to make them Believe even harder. It’s bizarre, the way they cling to it. We skeptics/climate realists prefer reality. Different strokes, I guess. Our stand is that we do not have enough data to present a valid climate model. You are claiming your models predict into the future. Yet this claim has been falsified on ~70 climate models. So far your models dont line up with the real world data that we are presenting. What could go wrong…. Moderator! Where is the moderator!? At 6/09/6:05 pm, Master_Of_Puppets posted an open incitement to mass murder. No [/sarc] flag in evidence. I’m weighing in with Pamela Gray 6/09/9:11 pm, rogerknights at 6/09/9:32 pm, Don at 6/09/9:44 pm, andrewmharding at 6/10/12:04 am and Matthew W at 6/10/7:40am. Please take out the trash. With the growing trend of the jet stream moving south here in europe, then there is a real treat of the gulf stream moving south as well. Because l think its was this very set up over many years is the thing what caused the ice age in europe. Because as the jet stream moved south it drew the trade wind to the south as well. Which in turn made the gulf stream flow across the Atlantic further to the south. This set up over a number of years would of brought climate cooling in europe for the ice sheets to expand south. Mosh is a model guy. He means well. But the models all fail. This is equivalent to an assertion that a bad model is better than no model. It also a serious fallacy. A “bad model” employed during a sailing trip or a wilderness hike could easily be a problem, even a fatal one. Consider the “models” that went into designing the racing yacht that recently failed catastrophically during trials for the America’s Cup competition. Models bias expectations. Bad models bias them badly. The point of the criticism of GCMs here is that they have no predictive skill. In fact they don’t have hindcast skill either and need to be “tuned” to match even the known past. The sole conclusion that can be drawn regarding this is that our actual understanding of the planetary energy budget is to poor to be relied on to create a working – as in a useful – model. It is as useful for understanding climate as Ptolemaic astronomy would be for placing an orbiter around Mars, that is, “not at all.” A bad model is useless, no matter how “tuned” it is, or how often. FAIL. In the meantime have you seen what the stubborn Arctic sea ice extent is doing currently? Yeah, it may all melt away mid September but it is interesting. Let me add a little meat to help fortify your good statements. More than not enough data, models used by the IPCC choose what data they want (they do not use ENSO else they’d find out that the oceans are responsible for most of it), and then adjust things so that it can be shown that CO2 done it. The models did worse than if they were random guesses. If you average them together they also miss the target. The only ones close, are the ones where CO2 would have to have been far lower than today. If they want to trumpet how well a couple of the models have done, they would also have to admit that those models which came close, are clear evidence that CO2 does not have an affect on climate. UK daytime peak yesterday was well below normal. The Met Office has delayed putting out May temperature data because they were so low! So what exactly do you call the radiation that can easily be measured coming down from the atmosphere at any point and time on Earth, looking up, including at night when there is no sun actively heating said atmosphere? Curiously, I’ve taught Maxwell’s equations at all levels from introductory through the graduate level, have an online textbook on Maxwell’s equations on my website, have rather a library of textbooks on electromagnetism, rather understand the Poynting vector and quantum electrodynamics (with a publication or two in the latter in Physical Review) and — gasp — when somebody shows me an upward looking spectrograph with a significant integrated power in the CO_2 + H_2O absorption band, I tend to conclude that back radiation not only exists and an easily derived theoretical truth, it really exists as a simple empirical truth. What exactly do you think of Grant Perry’s “A First Course in Atmospheric Radiation” or Cabellero’s book on Climate Physics? I had no difficulty reading or understanding either one, and found no glaring errors in the physics of either one. Perry makes no claims whatsoever for CAGW or some particular value of climate sensitivity or feedback — that’s beyond the scope of the physics — but the science presented is AFAICT rock solid and the empirical evidence for the GHE effect in action presented in the book is (again IMO) conclusive to anybody who isn’t a complete idiot and understands (as you say) Maxwell’s equations and what the flux of the Poynting vector integrated over the spectrum stands for. I’m asking these questions rather seriously. You claim to be an expert, sufficiently expert to speak for me (a Ph.D. theoretical physicist who teaches this stuff literally all the time — it is my profession). Yet I cannot imagine why “Maxwell’s equations” in any way prohibit or disprove the greenhouse effect, especially when an ordinary broad spectrum photometer (or better yet, an actual spectrometer) can measure the downwelling radiation you claim does not exist, in the latter case in bands that precisely match the absorption spectrum of the atmospheric species that you allege cannot be producing them. One of many nonlinear, discrete changes that could completely and suddenly reset the thermostat for the entire northern polar region and, in turn, the globe. Because of the in the Stefan-Boltzmann equation, thermal homogeneity of the globe favors warming — spreading the available heat budget around in the heat capacity of the globe to keep it all at a single temperature makes that temperature signficantly warmer than it would be if the distribution of heat/temperature were highly localized, e.g. confined to the tropics. Conversely temperature inhomogeneity (for an equal heat flow budget) favors cooling — hot spots radiate a lot more power than cold spots once scaling is taken into account. Any diversion of the Gulf Stream south would effectively heat the tropics while ceasing to heat the northern latitudes. The hotter tropics would actually cool more efficiently than the northern latitudes do — doubly so because of the Jacobean of a sphere (a lot more area near the equator than the poles) and because of the in the luminosity. This would suddenly and significantly drop global average temperatures, causing the northern latitudes to resume glaciation (positive cooling feedback from increasing albedo) and probably would seriously affect growing seasons and zones in the polar latitudes both north and south. I’m guessing that the additional heat in the tropics would also increase tropical humidity and instability, increasing cloud cover and heat transport up through the lower troposphere to where it can radiate away (further increasing cooling efficiency). Sure, I could be entirely wrong. This is a semi-heuristic argument, and we have damn all data or computable theory to support it. But the point it makes still stands — the Earth’s climate system is enormously nonlinear, and simple changes in the patterns of circulation — quite possibly changes brought about by warming — can create enormous changes in heating or cooling efficiency in the dynamical system. There is a rather large mystery in the global climate record over long times — large fluctuations in mean temperature over decadal to century time scales that we cannot explain, fluctuations of 2-3 C either way, probably even larger than this when one accounts for the fact that most of our proxies average over an interval of years and hence cannot be properly compared to the high frequency contemporary record save by noting that their probable fluctuations increase the peaks and troughs by at least some percentage over the coarse-grained means. Perhaps this — or any of the other candidates for state/attractor changes in the coupled chaotic nonlinear oscillators associated with oceanic currents and heat flow or atmospheric charge/discharge cycles and heat flow — is an explanation. So sure, this could happen (IMO, anyway). But will it happen? I have no possible way to even guestimate the probability, and we have no data that would help us understand if this is e.g. why the MWP ended or the LIA began. Or what the proximate cause (if there is any such thing) of a diversion in the jet stream or the Gulf Stream might be. It could be as subtle as a Brazilian butterfly or as overt and obvious as a hitherto misunderstood coupling between solar magnetic state and the atmospheric flow patterns. Can’t we start throwing out models which have outputs that are too far outside of observations. One thing l think that would cause sudden cooling as least for part of the NH. Would be if a southern tracking Polar jet that was over the ocean pushed northwards up and over the pole and came back down on the other side of the NH. That would draw a lot of moist air over the pole and cause cold and snowy on the other side of the NH. It appears that this report on a paper in SCIENCE, is about the same paper as these same authors, Bjorn Stevens , director of the Max Planck Institute for Meteorology, in Hamburg, and Sandrine Bony, a CNRS senior scientist at the Laboratory of Meteorology Dynamics (in French) in Paris, that I just found in Physics Today for June 2013. In the PT paper, the authors thank Kerry Emanuel, Isaac Held, John Mitchell, as well as Peter Humbug, for their thoughtful comments. They continue to assert the 3.45 K value for the climate sensitivity that CO2 doubling has been reputed to be responsible for. Does anyone realize how bloody cold 3.45 K is. Can’t they simply say 3.45 deg. Celsius, so we know what they are talking about. The Kelvin scale of Temperature is an absolute scale. As for models, and modeling, they are essential tools of science and engineering. Models allow you to perform experiments, with variable values, that no experimenter ever used or observed in practice. Often, those values are within ranges, where experiments have actually been performed. But there is an a priori assumption, that the models’ simulations, actually replicate the results of real experiments. I have done plenty of modeling in design. For example modeling down to the bare metal, and implant or diffusion profiles of doped semi-conductor layers, as laid out in Dr. Andy Grove’s textbook, on Semi-conductor Device Physics; literally designing my own devices from the physics, and layer processes offered by the silicon foundry, who would fabricate the wafers. That also had to include SPICE modeling of the actual circuit designs, whether simply logic gate switches, or more complex modeling of analog circuits; maybe some op amps or band-gap Voltage reference circuits. These models had to perform accurately, because, it simply is way too expensive to build a modern integrated circuit, without SPICE modeling, including parasitic device effects telling you before hand that it was going to work properly. It is one thing to SPICE model an analog circuit, that is set to its nominal operational condition, within the range of its intended use. But what the hell is it going to do, when you turn the power supplies on, and the whole thing is going to start from zero Volts everywhere. Why should it even start up at all, instead of just sit in a corner, and sulk; unless you repeat all the modeling over the power on transient conditions as well. You have to design the circuit so that it is forced to go to a rational state, within the normal operational range. But, you still aren’t done with it. Now you have to make sure that the startup circuitry then gracefully exits stage left, so that it no longer has any influence on the functioning circuit. One of my earliest efforts in analog circuit IC design, failed ignobly, for the simple reason, I failed to assign some circuit elements, to forcibly wake the thing up, when the power turned on. These things have to raise themselves by their own bootstraps. The circuit itself, was truly wondrous, even to this day. Fat lot of good that is if it won’t turn itself on. So a model, that will not definitively tell you whether the global Temperature will go up, or go down, when you double the CO2 amount; and moreover, how much it will move; is about as useless as an analog IC circuit design, without a startup circuit. Every single IC I designed, that went to mask making, functioned properly , and with high good die wafer yields. Luckily, a colleague doing a CMA audit of my enhanced sleepiness circuit, discovered the fox pass before we went to tapeout, so the wakeup call could be added. I don’t do that any more, I model optical systems instead; both imaging and non-imaging sensor optics, as well as both imaging, and non-imaging illumination optics. You might have one of them in your hand right now, if you still have an actual computer, instead of a video game. So far, I have never had a modeled design, ever go to manufacturing, and fail to operate pretty much exactly as modeled. It is simply not feasible to build such stuff without successful modeling. And when you have 13 or 19 or whatever, highly touted different models; no two of which agree with each other; and none of which agree with the experimental world view of what is purportedly modeled, then you are simply selling phraud. So Robert, I hunted, but couldn’t find exactly where this mutt latched on to your ankle; so I assume it is best not to look. For the life of me, I can’t see just where Maxwell’s Equations “from 2nd year degree level”, would throw any light on the upness or down-ness of atmospheric LWIR radiation, to the point of excluding the existence of one of the two. One thing is for sure, the atmosphere, including clouds, does not really “reflect” LWIR radiation. Clouds in particular, consisting partly of non-gaseous phases, very strongly absorb surface emitted radiation, and then subsequently emit new LWIR photons, of an entirely new frequency, and more importantly, with an omnidirectional isotropic, angular distribution, which in the normal course of events, would mean that about half of it was emitted upwards, and the other half downwards. Moreover, with the highest densities being closest to the surface, one might expect the atmospheric GHG absorption to be strongest, close to the surface, which would seem to warm the surface hugging atmosphere in assistance to the conductive warming of the near surface air. So the GHG absorption bands, would seem to enhance the upward convection of heated air, which would be an aid to cooling. But how the downward “back radiation” half of the atmosphere/cloud re-emission of LWIR radiation got disappeared, and Maxwell’s equation’s participation in that travesty, is a real stumper for me. Seems to me that ME is/are the ultimate survivors, since not withstanding the Bohr-Sommerfeld trashing of ME’s insistence that accelerated electric charges radiate, ME today survives healthy, and with the only exact constants, in all of physics. I do hope you can shake that pest off your ankle. Modeling has just turned the corner on 3-4 km grids for weather models on a global basis (good enough to start modeling clouds insteead of parameterizing them) by using GPU technology. NCAR’s CAM is also being ported to GPUs. Video games rescue climate science! My suggestion is you guys read more and post less. That’s impressive, so how much of the total surface area of the earth, are they making these measurements on a 3-4 km rectangular grid. That’s a lot of points to be making measurements at. I presume that they must have all their equipment interconnected some how, so that they measure every one of those points, at the same instant of time. What would be the good of having measurements at a whole bunch of points, if they aren’t all taken at the same time. I know if you try to model currents flowing in a circuit by measuring the Voltage at a whole bunch of nodes, it isn’t worth a damn, unless they are all measured simultaneously. There must be something about modeling climate, that I don’t understand. The double counting begins with AGWScienceFiction’s Greenhouse Effect Illusion’s energy budget giving shortwave from the Sun, mainly visible, the property of longwave infrared, that is, heat, in order to promote the science fraud that no longwave infrared from the Sun heats the Earth, so they can use real measurements of any downwelling longwave infrared and attibute it all to “backradiation by greenhouse gases from the atmosphere” and not from the Sun. So the Trenberth and ilk cartoon is still attributing all of longwave infrared to “shortwave in”, but that is actually the whole of the amount from the Sun in their cartoon, not part of it. rgbatduke – where are these measurements of downward longwave infrared at night? So, back to my question, what exactly is happening here? “0 to 350 W/m2. Global mean = 158 W/m2, Minimum = 0 W/m2, Maximum = 323 W/m2. (Source: NASA Surface Radiation Budget Project). Is this including or excluding the missing heat longwave infrared direct from the Sun of the GHE energy budget? Or is that mean what shortwave alone would be in the solar constant divided by four? “It is dominated by the shortwave portion” – how is it showing this? Is this or isn’t this measuring what is reaching the surface? What does what happens next matter? Again, how are they showing that shortwave dominates, and, why are the figures for combined less than shortwave alone? I should be grateful if you would take a look. Am I missing something? @george e. smith – if you look at the slides I linked to, you’ll see that the grid is a grid of hexagons, not rectangular. The time step on a 10 day forecast is about 2 minutes. Also, a global run takes 50% of real time to complete, so a climate study of 100 years would take 50 years to run! But these models running on massively parallel GPU based systems are already helping weather forecasting.